The Belize Barrier Reef is a series of coral reefs straddling the coast of Belize, roughly 300 meters (1,000 ft) offshore in the north and 40 kilometers (25 mi) in the south within the country limits. The Belize Barrier Reef is a 300 kilometers (186 mi)-long section of the 900 kilometers (560 mi)-long Mesoamerican Barrier Reef System, which is continuous from Cancun on the northeast tip of the Yucatán Peninsula of Mexico through to offshore Guatemala, making it the second largest coral reef system in the world after the Great Barrier Reef in Australia. Charles Darwin described the Belize Barrier Reef as "the most remarkable reef in the West Indies" in 1842. It is Belize's top tourist destination, attracting almost half of its annual 260,000 visitors, and vital to its fishing industry. Conditions for scuba diving and snorkeling are ideal since water visibility commonly reaches 100-plus feet; water temperatures hover around 80 degrees Fahrenheit; and the barrier reef makes for calm water most of the year. Coral can be sensitive to environmental changes, such as changes in nutrients, temperature, and pollution, as well as physical damage related to tourism and fishing. In recent years, concern has grown that climate change associated with global warming and harmful influences of human use have become a serious and compounding threats to the reef. Both the living coral and the wondrous other creatures who occupy the reef are in jeopardy without the addition of protective measures. The Belize Barrier Reef System offers a diverse ecosystem and more varieties of coral formation than anywhere else in the Caribbean. It lies on the rim of a continental shelf approximately 160 miles (257 km) long and 10-25 miles (15-40 km) wide. Within a half mile (800 meters) of the reef crest, the seaward edge of the shelf drops steeply to 9,000 feet (3,000 m). The sea is predominantly shallow north of Belize City, forming a flat shelf where sea grass grows. With the exception of Ambergris Caye, the cayes in this area are mangrove in origin, built up by sedimentation over the years. South of Drowned Cayes, the shelf begins a slow descent to depths of 180 feet (60 m) at the southern end. There is a gradual widening of the back reef lagoon as it moves southward. The central back reef is characterized by a deep channel running in a north-south direction from Belize City to the Gulf of Honduras, bounded on the east by shallow shelf and on the west by the mainland coast. The seaward shelf, which terminates at the reef crest, has numerous patch reefs and a few mangrove cayes. 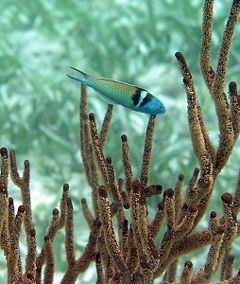 Grass flats cover most of the shallow bottom between the cayes and patch reefs. The southern reef shelf is a broad section of the lagoon, filled with a variety of reef structures, that stretches from Blue Ground Range, just south of Dangriga, to the Sapodilla Cayes. The shelf in this area is cut by two deep channels, the Main Channel and Victoria Channel, both of which reach depths of 100 feet (30 m). There are numerous shoals, banks, ribbon, and patch reefs found in this area. Numerous shingle and mangrove cayes are found within the shelf lagoon. A characteristic feature of the southern shelf lagoon is the formation of faros, which are large limestone structures consisting of an outer rim that encloses other reefs and lagoons. Rim walls are narrow and steep. Inner reefs are highly variable in size and form. This complexity leads to a remarkable diversity of habitats and organisms. On the seaward side of the southern reef complex the Cayman Trench has its southwestern end some 10-16 kilometers east of Gladden Spit. This is believed to have an effect on current and nutrient patterns in the area, although no conclusive scientific evidence has been provided. Three atolls lie just outside the reef. The coast of Belize lies in the outer tropics, characterized by higher extreme and mean temperatures than occur in lower tropical latitudes. Mean annual temperatures range from 16-17°C in winter to 24-25°C in summer, in Glover's Reef atoll to the south; and from 23-26°C in winter to 28-31°C in summer, in Bacalar Chico to the north. Mean annual precipitation fluctuates between 1500 mm to the north and 4000 mm to the south. A dry season characterized by strong easterly winds runs from January-February to May-June. Strong winter storms blow from October to February, often as "northers," which bring cool temperatures, heavy rains, strong winds, and rough seas. Until May, winds tend to be strong and fairly constant. In the summer there are occasional strong squalls. The hurricane season occurs between August and October. 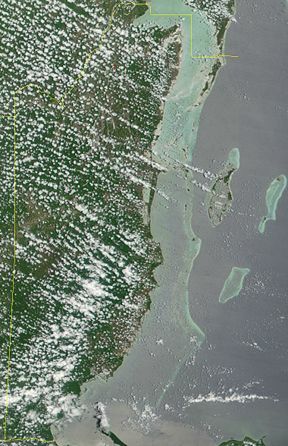 The Barrier Reef is clearly visible along the Belizean coast. The coastal area of Belize is an outstanding natural system consisting of the largest barrier reef in the northern hemisphere, offshore atolls, several hundred cayes (pronounced "keez" and derived from the Spanish cayo for "key" or "islet"), mangrove forests, lagoons, and estuaries. The system’s seven sites illustrate the steps in reef development. 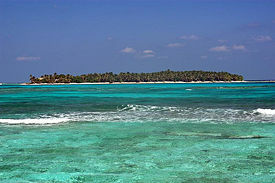 Of the thousands of atolls around the world, only four are found in the Caribbean, and three of these are in Belize. These reefs form on the edge of a submerged volcano. A fringing reef is formed from coral living on a shallow underwater shelf extending from land. Barrier reefs run parallel to the coast. With 90 percent of the reef still needing to be researched, it is estimated that only 10 percent of all species have been discovered. The area is a significant habitat for threatened species, including marine turtles, manatees, and the American marine crocodile. Dolphins are also found. Manatees were commonly hunted for their meat by natives of the Caribbean, although this is much less common now. Today, manatees are considered endangered and protected, but one of their main sources of mortality is collisions with boats and propellers. "Belize is considered the last stronghold for West Indian manatees [one of the three species, the others being Amazonian and West African] in Central America and the Caribbean," in part due to its extensive sea grass, mangrove, coastal, and riverine habitats and in part due to local conservation efforts. The sea grass beds in the shallow waters at the northern part of the reef harbor barnacles, conches, crabs and other shellfish, anemones, seahorses, sponges, and starfish. Among the birds to be seen in coastal areas and on the islands are brown pelicans, frigates, laughing gulls, ospreys, ruddy terns, brown boobies, and on Belize's first national park, Half Moon Caye Natural Monument, the rare red-footed booby. The Belizean Barrier Reef provides a habitat for a wide variety of game fish, including tarpon, grouper, cobia, permit, barracuda, bonefish, rainbow runners, and triggerfish. The deeper waters beyond the reef are the home of sailfish, marlin, wahoo, mackerel, bonito, pompano, blue fin, black fin, and albacore tuna. A variety of other tropical fish swim among the reefs, including angelfish, parrot fish, yellowtails, as well as moray eels and sting rays. The offshore atolls offer superb fishing due to their remote location and unique geological features. Waters plummet thousands of feet only 200-300 feet from the reef crest on all sides of the atolls. Populations of game fish have declined over the past 30 years due to habitat destruction, pollution, and over fishing. Catch-and-release fishing is encouraged. 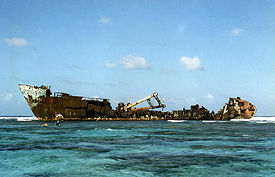 The barrier reefs of Belize are littered with shipwrecks. This one is near Half Moon Caye. Cayes include: Ambergris Caye, Caye Caulker, Caye Chapel, St. George's Caye, English Caye, Rendezvous Caye, Gladden Caye, Ranguana Caye, Long Caye, Maho Caye, Blackbird Caye. A marine reserve is an area of the sea which has legal protection against fishing or development. This is to be distinguished from a marine park, but there is some overlap in usage. Because of its exceptional natural beauty, significant ongoing ecological and biological processes, and contains the most important and significant natural habitats for in-situ conservation of biological diversity, the Reserve System has been designated as a World Heritage Site since 1996. Despite these protective measures, the reef is under threat from oceanic pollution, uncontrolled tourism, shipping, and fishing. Any increase in ocean temperatures poses a particularly significant threat, causing coral bleaching. "There is growing concern that global climate change is degrading coral reef ecosystems, with coral mortality increasing as a result of bleaching and emergent diseases: our results from Belize appear to justify this concern," said Richard Aronson of the Dauphin Island Sea Laboratory in Alabama. It is claimed by scientists that over 40 percent of Belize's coral reef has been damaged since 1998. Belize, because of its medley of cultural attractions, unique marine and terrestrial biodiversity, and conservation efforts, is fast becoming a hot spot for travelers seeking ecotourism and adventure vacation experiences. Sea kayakers can arrange day trips or overnight packages with licensed guides. Drop offs exceeding 1,000 feet beckon divers from around the world. The three major industries in the coastal zone, tourism, aquaculture, and fisheries, accounted for some $600 million Belize Dollars in 2006, with tourism the largest income earner, averaging $500 million of the $600 million. This is a doubling of the earnings from this sector in 2000, when it accounted for some $240.1 million. Since 2000 there has been a consistent increase in the income earned from tourism. Statistics show that overnight arrivals have increased steadily from 195,766 in 2000 to 247,309 in 2006. Cruise tourism has not been so consistent. There was a remarkable increase in cruise visitation from 48,116 in 2001 to 319,690 in 2002. There was a more gradual increase to 851,436 in 2004 and then a gradual decline to 655,931 in 2006. The recent surge in tourism growth has resulted in substantial investment and development. However, despite the fact that cruise tourism accounted for only $31.01 million in 2006, the bulk of the investment and infrastructure development in the industry over the last six years has been to accommodate the cruise industry. It is estimated that 80 percent of all tourism visitors head to destinations within the coastal zone. If global warming were to result in sea level rise, increased sea surface temperatures, changes in weather patterns, and increased storm activity, corals would be adversely affected as they are particularly susceptible to such events. Such changes can result in bleaching, disease, and physical damage. Mangroves and sea grass beds would be most affected by changes in weather patterns and by storms, which could not only damage them but result in changes in biological processes such as reproduction. One report evaluating the potential effects of global warming concluded that coastal areas, beaches, and cayes "would suffer from inundation, erosion and storm surges. The socioeconomic impacts will be from loss of habitat and coastal areas which in turn will directly affect the tourism and fisheries industries." In addition to the potential damage to the reef system from a warming climate, the Belize Barrier Reef faces other environmental challenges. Perhaps the most significant is the disposal of solid and liquid wastes, particularly from the shrimp and citrus industries. Mining of aggregates (materials used in construction, including sand and gravel) from rivers and streams also affects the local watersheds, which empty into coastal waters. As the tourism industry grows, development of hotels and resorts in sensitive areas could have a negative impact. ↑ Sue Wells, Belize Barrier Reef Westminster College. Retrieved February 2, 2009. ↑ BBC News. May 4, 2000 Coral collapse in Caribbean Retrieved February 2, 2009. ↑ Roger Harrabin. June 12, 2006. Reef at forefront of CO2 battle Retrieved February 2, 2009. ↑ 5.0 5.1 5.2 Belize Tourism Board. Belize, The Natural Choice Retrieved January 31, 2009. UNEP World Conservation Monitoring Centre. Belize Barrier Reef Reserve System Retrieved February 2, 2009. UNESCO World Heritage Centre. Belize Barrier Reef Reserve System Retrieved February 2, 2009. History of "Belize Barrier Reef"
This page was last modified on 1 June 2016, at 20:17.